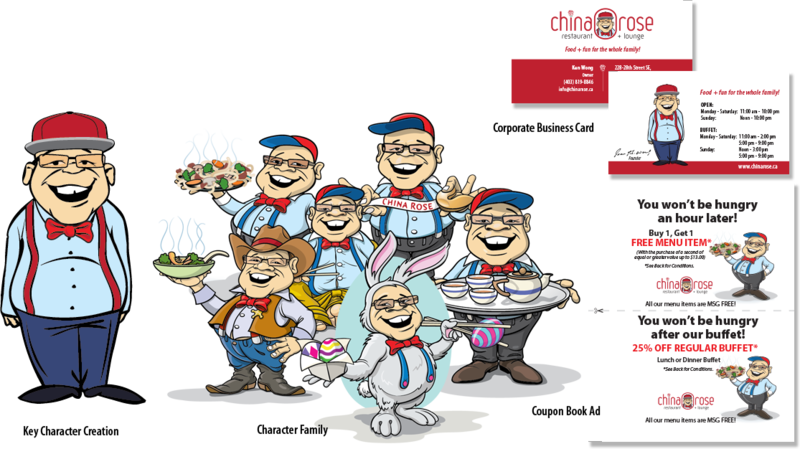 For over 25 years the China Rose Restaurant has been the culinary landmark in Calgary offering consistently mouth-watering tasty food served in generous portions at very reasonable prices. We were approached to rebrand the restaurant so they would not blend-in but stand-out in the highly competitive restaurant market. After many discussions about who they were, their story and history, we uncovered a unique and inviting story around the restaurant founder. So we recommended that their new brand should revolve around the founder. We created and developed the core character along with numerous character adaptations to be used for various marketing and promotional applications.